Santorini is part of Greeces Cyclades island group in the Aegean Sea, approximately 140 miles from Athens. Depending on the U.S. departure city, flights are available to Athens by Air France, British Airways, Delta, KLM, Lufthansa, Swissair, and TWA. Flying time from New York to Athens is eight hours on direct flights. The 1-800 phone numbers and Web links for these airlines are available at this magazines Airlines page. The Greek Islands are served by Greeces Olympic Airways. Mykonos is a 45- minute flight from Athens. There is not a U.S. 1-800 phone number for Olympic. Booking flights through a travel agent is recommended. You can also book flights by calling Olympic Airways directly in Athens from the U.S. at 011-30-1/969-4466. Buses connect the airport, Fira, Ia, Perissa and Kamari beaches, the port of Athinios, and other villages. Auto rentals are discouraged for getting around tiny Mykonos. The narrow roads make for dangerous driving conditions for the unitiated, and there is very limited parking outside the caldera rim towns such as Fira and Ia. If you do decide to drive, car rentals are available at the airport from Avis and Hertz. It is recommended to rent prior to arriving in order to achieve the best pricing. The 1-800 phone numbers and web links for these firms are available at the Autos page. Visitors can also arrive by ferry from Athens (Piraeus) and other Cyclades islands, docking at Athinios port, with connections via taxi and bus to other parts of the island. Some smaller ferries and cruise ships debark at Skala, directly below Fira, and passengers must take the funicular or the 45-minute walk up to Fira town. The port police (0286/22239) can provide information on ferry schedules. Santorini contains a number of lodging alternatives, ranging from hotels and apartments in the western, caldera-rim towns, to beach-side villa resorts on the islands eastern shore. Fodors Greece does a good job of rating the alternatives in various price ranges. We picked Dana Villas in Fira, and we were well satisfied with the choice. In addition, this travel book covers all of the major cities (lodging, dining) and attractions throughout Greeces mainland and the remainder of the Greek Isles. This and other guidebooks are available through the amazon.com ad link below. 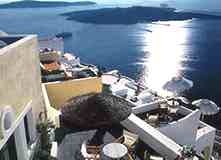 Santorini comprises about 36 square miles (96 sq. km.) with a landmass formed like a semi-circle. The high point is 566 meters in altitude, and is home to a monastery of the Prophet Elijah (Profitis Ilias). Santorinis temperature is pleasant in May and October, and hot in the summer. Santorinis majestic caldera location has made it one of the most popular tourist destinations in the Greek islands. Due to limited tourist accommodations, it is advisable to make early travel arrangements. Santorini is the southernmost of the Cyclades islands. Nearby Clycades islands which are worthy of a visit include Ios, Naxos, and Paros, all within 40 miles via ferry. The popular island of Mykonos is approximately 50 miles distant, and is reachable by Olympic Airways (15-minute flight) or by ferry. Greece's Friendly Mykonos Island is a recent article on traveling there.